We are Staying, 2015, handmade egg tempera, installation, SPACE Gallery, Portland Maine, USA from May - July 2015. We are Staying is a graphic rendering of an urban environment in Syria. It is a composite of images and descriptions of Aleppo, Saraqib, Hama, Homs, Damascus and Daraa taken from conventional and social media sources over the last three years. Here, disparate geographies and unorganized moments in time overlay each other, reflecting both a fragmented understanding of these accounts, and the conscious and unconscious attempts to recompose a potential reality. This installation was created over the course of two weeks on-site with classically prepared egg tempera paint. Gallery wall installation view, 15.54 x 3.65 mt, egg tempera, 2015. In early 2012, the Syrian government launched airstrikes and mortar attacks on populated neighborhoods to crush the rising revolution, killing and detaining hundreds of civilians. That February, acclaimed journalists Anthony Shadid and Marie Colvin died while on assignment in Syria, bringing further attention to the spreading conflict. And the deaths of many other photographers and journalists were to follow. Rear gallery wall installation view, 4.5 x 3.65 mt, egg tempera, 2015. Since that time, the Syrian War has become one of most tragic conflicts since the Second World War. More than 200,000 people have lost their lives, millions of refugees have flooded into neighboring countries, and millions more have been displaced internally. The conflict has taken on the form of multiple proxy wars, involving the interests and interventions of many regional and global powers. Drawn to understand the increasingly shocking and complex evolution of the Arab Spring, I began researching and reaching out to make contact with those effected by this crisis. The relative absence of journalists on the ground within the changeable margins of this war-zone has turned the multitude of raw-footage, photographs, documentary snippets and staged fabrications into the primary source of information, even for large news agencies. No longer only in the form of the familiar, neat and researched articles, this sea of fragmented and stratified documentations come forth filtered by chance as well as by multiple, calculated and unknowable internal dialectics and interests. The immediacy and ease in which we communicate, organize and encounter each other online is magnifying the intensity of our togetherness, and producing intentional and unintentional ways in which we potentially affect each other. How do we process, recompose and interpret this multitude of information? What are the outcomes of our interpretations? Do we have a responsibility to attempt to assemble this information for ourselves? Gallery wall installation view, 16.67 x 3.65 mt, egg tempera, 2015. 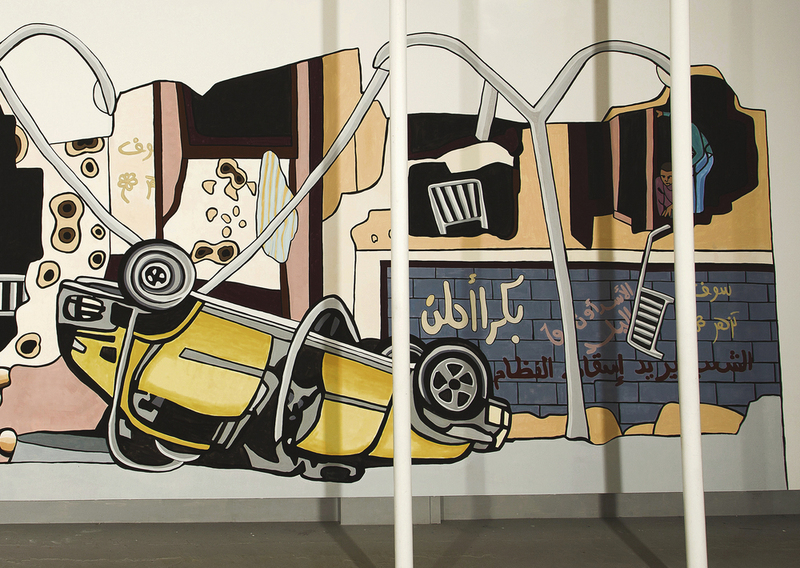 We are Staying is a graphic rendering of an urban environment in Syria. It is a composite of images and descriptions of Aleppo, Saraqeb, Hama, Homs, Damascus and Daraa taken from conventional and social media sources over the last three years. Some elements of this compound city include a horse decorated for the celebration of Eid al-Adha, a guard post of a Liwaa al-Sultan Mrad brigade member, a mosque destroyed, an overturned car, damaged yet inhabited apartments, hanging sheets to obscure a sniper’s line of sight, and a foosball table. Artist installing the work on site at SPACE Gallery, Portland, Maine, 2015. The graffiti elements in this painting are inspired by city walls that have become marked and layered with pro-government threats, revolutionary slogans and expressions of hope, memorial and desperation; a fluid partial record of the ongoing conflict. Special thanks to Kifah Abdulla and Nihad Akkad for their assistance in translating the graffiti slogans used in this exhibition. Thanks to journalists Hannah Lucinda Smith, Medyan Dairieh and Nour Kelze for their encouragement. Thanks to Karyn Thomas and the Small Projects Istanbul for Syria students and families for welcoming me into their community. To learn more about Small Projects Istanbul for Syria and how you can help visit www.smallprojectsistanbul.org. Thank you to my husband Giuliano Matteucci for his support and creative collabortaion. And to Daniela Salvati and Domenico Matteucci for their support in Rome. This project would not have been possible without the wonderful volunteers at SPACE Gallery who helped this project come to life: Michel Droge, Anna Bourakovsky, Karin Carlson, Kim Largey, Doug Milliken, Saleha Belgaumi, Fae Nason, Mandy Morrish, Rachel Romanski, Jewel Rechsteiner, Alyssa Stoisolovich, Susan Gallo, Katy Nicketakis, Jaime Wing, Alison Hildreth, Mimi Gallo and Debrah Luhrs. Thank you to the Hunt and Alpine Bar for donating their egg yolks to make the tempera paint used in the installation and finally thank you to the amazing team at SPACE Gallery for hosting me and my work.